To discover other pages please click on the top right. the page numbers appear there. University of Cambridge researchers print two types of retinal cells from adult rats and hope the development could one day contribute to a cure for some types of human blindness. A surprising study has found that a simple acid bath might turn cells in the body into stem cells that could one day be used for tissue repair and other medical treatments. yes Gérard if a simple acid bath can turn any cell from the human body into a stem cell it is very good news. 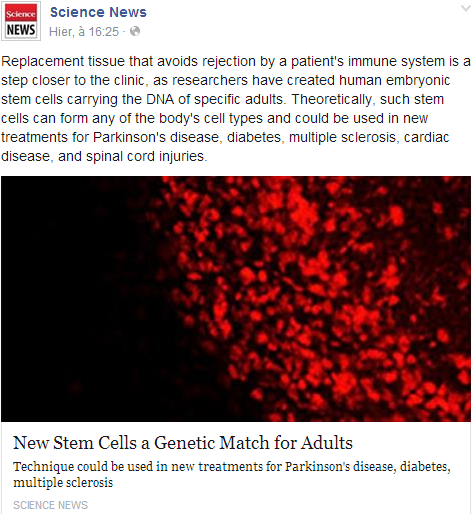 when stem cells derive from embryonic tissues there is an ethic problem . That 's the reason why France is lagging behind as far as researches are concerned. Gene types that influence disease in people today were picked up through interbreeding with Neanderthals, a major study in Nature journal suggests. They passed on variants involved in type 2 diabetes, Crohn's disease and - curiously - smoking addiction. Genome studies reveal that our species (Homo sapiens) mated with Neanderthals after leaving Africa. Eh bien voila que maintenant, c'est 20 % ! -> Plus de Neandertal en nous ? En comparant des génomes ancien et modernes, des scientifiques américains ont découvert qu’environ 20% du génome néandertalien persiste dans les populations humaines actuelles. Si je comprends bien, les 4 % sont le pourcentage de gènes en chacun de nous (hors Afrique), les 20 % représentent le pourcentage de la variété de tous les gènes. The books are about the period of co-existence between Cro-Magnons and Neanderthals. I have read them in French. The clan are the Neanderthals and the others are the Cro-Magnons. It was very interesting to note their mental differences. Physiologically, the Clan are heavier and broader but also shorter than the people of The Others. They are very slow to embrace change and to innovate, and they still chase after animals to spear them directly, whereas the Cro-Magnons are enthusiastic about innovation and have moved on to projectile spears. The Clan's tools, clothing, and household implements are similarly less refined and sometimes less effective than those of their Cro-Magnon counterparts, whose implements and other goods are more technologically sophisticated. The Clan's reluctance to change is depicted by Auel as a function of their cognition; they are presented as dependent upon their racial-genetic memory. The average Clan child needs only be 'reminded' of a thing to know it permanently, though skilled tasks still require repetitive practice. Furthermore, the need to encode everything into a child's brain has increased the average Neanderthal head size to the point that, by the time of the first novel, women of the Clan are having trouble giving birth to their large-headed babies—a sign that their evolutionary strategy has run its course. Earth's children from Jean Marie Auel is very convincing because true to life. 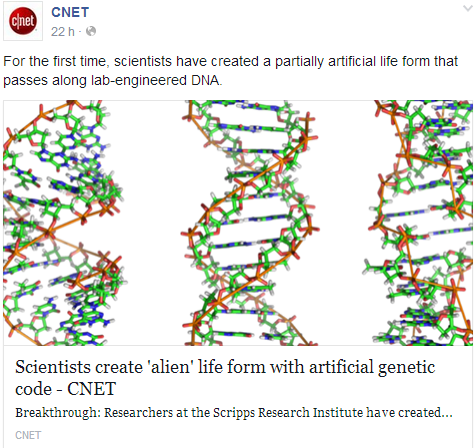 No other comment than "Scientists create 'alien' life form with artificial genetic code"... what do you think? It's amazing and I also support science and research as long as man remains wise and careful. Anyway the question " how far can we go in playing the sorcerer's apprentice ?" remains to be asked. what is useful is to improve life not to the detriment of safety that's all. We don't care about researchers' vanity or purse. Changing Our DNA Through Mind Control? Don't you anticipate a bit here guys?? "Findings from a new study published in Cancer by a Canadian group suggest that our mental state has measurable physical influence on us – more specifically on our DNA." mind and body are likely to communicate . People somatise. Anyway to be able to change DNA through mind control is amazing ! Rumors abound that scientists are working on editing the genes of human embryos. ANCIENT HUMAN WITH 10 PERCENT NEANDERTHAL GENES FOUND: The finding of a cross-breed suggests that interbreeding with Neanderthals was more common than previously thought. The DNA finding suggests that Interbreeding with Neanderthals appears to have been more common than previously thought. Two teams of scientists have found different ways to perform the same biological identity swap: turning skin cells into neurons. Both approaches involve merely adding a few chemicals to cells and could lead to new ways to treat a person’s disease using cells from their own body. Scientists successfully restored full youthful plasticity in adult mice by transplanting young neurons into their brain—curing their severe visual impairments in the process. Mess with any of these genes and you’ll find yourself kaput.